When I pushed the thrust levers forward for takeoff in the newest version of Cessna’s Citation Sovereign, not only did the big jet surge forward but something else interesting happened: at about 75 percent N1 the power levers moved forward on their own and set takeoff power precisely, rather than require Shannon Peterson, senior pilot flight operations, to make the fine adjustments for takeoff power. Shortly thereafter we reached rotation speed, I pitched into the V-bars on the flight director and the powerful Pratt & Whitney Canada PW306Ds launched the Sovereign skyward. This still experimental “new” Sovereign is the updated version of Cessna’s big midsize jet. While it’s easy to spot the new Sovereign with its gracefully upward-curved Cessna-designed winglets, there is a lot more to the upgraded jet. The biggest change to the Sovereign is an all-new flight deck featuring Garmin’s touchscreen-controlled G5000 avionics, which is also in the new X as well as the upcoming Longitude and Latitude. The Part 23 M2 is equipped with the Garmin G3000 system, which is functionally similar to G5000 and uses basically the same touchscreen controllers. The G5000 in the new Sovereign and X replaces a Honeywell Primus Epic system. Cessna didn’t just choose the G5000 for the new Sovereign; it also took the time to redesign the cockpit, adding Garmin-designed autothrottles as standard equipment too. The cabin is also new, and v-p of interior design and engineering Cynthia Halsey and her team worked their magic in both the cabin and cockpit to create a harmonious look and feel. Cessna’s Clarity cabin management system, based on a Heads Up Technologies fiber-optic backbone, is also a key element in the new Sovereign, X and other new Cessna jets coming on line in the next few years. The Sovereign’s engines received a power boost, with the new PW306Ds producing 5,852 pounds of thrust, up from the original Sovereign’s 5,770-pound PW306Cs. Without taking into account the efficiency benefits of the autothrottles, the new winglets and more efficient engines add 150 nm to range, which increases to 3,000 nm. There are many other more subtle changes to the new Sovereign, which Peterson pointed out during our walkaround. All external lighting is now LED-based, which should simplify maintenance because LED lights last far longer than incandescent bulbs. The wingtip lighting LRUs, which contain the nav lights and anti-collision lights, are made by Whelen Engineering. The LEDs inside the cockpit and cabin are also made by Heads Up Technologies, as are the emergency egress lights, airstair lights and threshold lights. The flashing beacon and nav lights are now automated. Turning on the battery automatically switches on the nav lights, and during engine start the beacon lights up. These can be changed in the G5000 settings menu, which is the only way to control these lights; there are no switches for them in the cockpit. The new winglets add a total of nine feet to the Sovereign’s wingspan, and Cessna engineers took advantage of the extra length to move the wing tanks out one more bay toward the tips. This added 62.5 pounds capacity per side and increased fuel capacity to 11,348 pounds. All weights increase by about 475 pounds, with maximum ramp weight now 31,025 pounds (up from 30,550), takeoff 30,775 pounds (up from 30,300) and landing weight 27,575 pounds (up from 27,100). The Garmin avionics are 100 to 200 pounds lighter than the Primus Epic system they replaced, according to Peterson. The winglets help improve second-segment and time-to-climb capability, she explained. Inside Cessna, the new winglets are referred to as “swooplets” because of their appearance. Another improvement attributable to the winglets is the ability to climb directly to 45,000 feet. Maximum altitude is the same 47,000 feet, at which cabin altitude remains 7,230 feet. Another more subtle change is the engine pylons, which are canted so that the tailpipe is moved four degrees outward, something that is perceptible only when looking at the engines from the rear and when pointed out. This design change helped lower VMCG (minimum control speed, ground) and reduced the wet-runway landing distance by about 500 feet. Nothing else has changed in the design of the wings and non-boosted flight controls, which consist of Fowler flaps and ailerons augmented by roll spoilers. The roll spoilers actuate depending on speed, with more spoiler added during low-speed flight. None of this makes the Sovereign handle much better than the big airplane it is. “It’s like the SUV of Citations,” said Peterson. The new Sovereign entered the flight-test program earlier this year, with the first flight conducted by Peterson and production flight-test pilot Matt Freund. Customer demonstrations began in July. What customers like about the Sovereign, Peterson said, is its ability to fly to Europe and Hawaii with plenty of margin, especially after taking off from smaller airports with runways from 4,000 to 5,000 feet long. 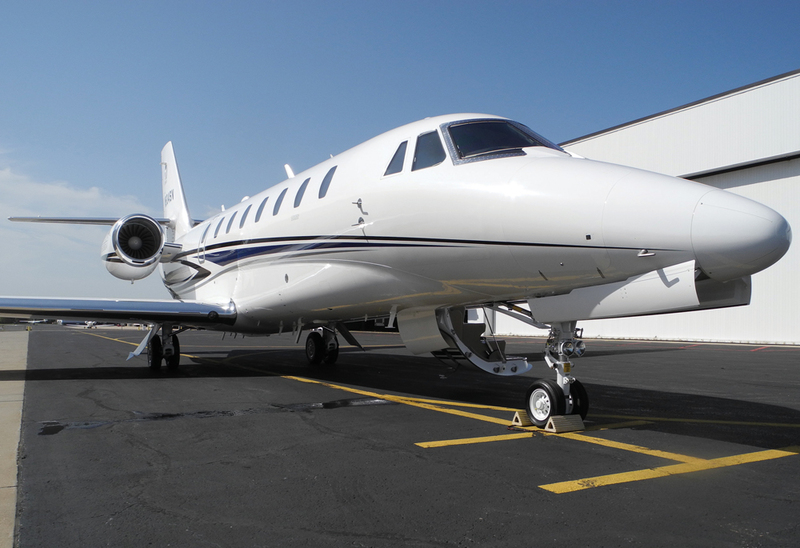 The Sovereign for now is Cessna’s longest Citation and it seats up to 12 passengers, although eight to nine is typical. The design team improved the cockpit ergonomics. The cockpit does achieve a look and feel in harmony with the cabin, but the big changes are the avionics, which are flanked by an all-black instrument panel instead of the previous gunmetal gray. The reason for this change is that avionics manufacturers keep making displays with black bezels, so designer Halsey and her team decided to go with an all-black panel instead of fighting to make black displays look good in a gray panel. “It was a big discussion,” Halsey said. But the result is a more integrated look and feel with no glare. “It makes all those trims pop,” she said. Two G5000 touchscreen controllers replace the two Honeywell FMS multifunction control display units (MCDUs) in the pedestal. The touchscreens with their digital icons make for a much more modern look compared with the MCDUs, which have their own displays as well as separate alphabetic and numeric keyboards, buttons and knobs. Each pilot has a cupholder on the outboard side, behind which is a recessed receptacle that is a perfect fit for a cellphone. The gust lock, which used to be on the bottom panel near the left-seater’s left knee, is mounted on the aft pedestal. The APU panel no longer exists as that is controlled via the G5000 touchscreens, which demonstrates a key advantage of the G5000 system: much more control with fewer knobs and switches, and thus a cleaner, less cluttered cockpit. Heads Up Technologies was also tapped to update the cockpit lighting. The flood lights are made with side-emitting LEDs and a special film, according to Heads Up president and CEO Rob Harshaw, “to create a soft uniform glow over a large area, thereby reducing glare at night.” The glareshield is fitted with LEDs molded into a urethane housing that “conforms to the shape of the glare shield and aligns the LEDs to minimize stray light,” he added. The dimmable map lights are designed to reduce stray light, putting out a spot measuring 8.5 by 11 inches, just right for viewing paper charts. One of the big changes that pilots will appreciate with the G5000 system is the rotary switch test. Instead of having to run through each test manually, the test is done automatically, speeding up the preflight process. Most cockpit switches are pushbuttons, which makes it harder to accidentally move a switch, something that is easy to do with toggles. Three-position switches like the generator switches remain toggle-types, however. The fully automated pressurization system picks up the destination altitude from the flight plan. The G5000 system consists of three 14-inch displays in landscape orientation and four touchscreen controllers, two in the center pedestal and one forward of each pilot’s side ledge. The big displays can operate as a PFD for each pilot with the MFD in the center, or each can take over any task from a failed display. The displays also can be split into 60/40 screens with PFD/MFD information on one display, depending on pilot preference. Control of the MFD can be switched between either center touchscreen. Backup air data and attitude information is provided by an L-3 Avionics GH-3000 electronic standby instrument system mounted above the MFD. Garmin’s Synthetic Vision Technology (SVT) is standard on the Sovereign’s G5000 system and displays terrain features, obstacles and traffic to help improve situational awareness. The G5000 system can be used to calculate weight and balance before takeoff, but at the time of AIN’s flight it wasn’t yet programmed with takeoff and landing performance data, and Peterson had to plug numbers in so the correct V-speed bugs would show on the airspeed tape. While the G5000 has few knobs and buttons, forcing the user to tap on the touchscreen for most functions, it does retain a rotary knob for pilots who are used to that interface. Frequencies are so easy to change on the touchscreen controller, however, that it’s hard to imagine wanting to go back to using the knob. Changing a frequency is as simple as touching the standby frequency then typing in the numbers after the “1” (which doesn’t need to be input; the decimal point is unnecessary, too). Just type the number, then tap Com 1 or 2 and the frequency is ready to swap into the active window. The CNS bar, which contains the audio and intercom controls, com frequencies and transponder settings, always remains at the top of the touchscreen controller. All other functions are available from the home screen, which is always just one button away. Some other G5000 features–and this barely scratches the surface–include the ability to place a holding pattern anywhere, not just where they are published. This is something that isn’t available on Garmin’s G1000 system, although many pilots wish it were. The Sovereign’s Garmin GWX 70 digital radar images can also be overlaid on the MFD maps, although not at the same time as Sirius XM WX images. Other cockpit amenities include dual cordless phone handsets hooked up to the Aircell GoGo Biz system (either standard Aircell air-to-ground for U.S. operations or also Aircell SwiftBroadband satcom). There is no need to break out the handset to send a text message (either to someone in the cabin or to the ground), however, as texting is a function in the services section on the touchscreen controller. ADS-B out-capable transponders are installed on the new Sovereign, and the G5000 will be capable of datalink communications (CPDLC). RNP 0.3 capability, when an inertial reference system is installed, will be an option. The changes that passengers will notice are a combination of subtle improvements that add up to a better travel experience. Halsey’s design team wanted to improve comfort while also optimizing the available space. People carry more small devices now and need an area to hold everything. The traditional low-mounted storage area is not easily reached, so Cessna’s designers created a “ditty” storage area in the side rail, using composite material that won’t scratch or harm a smartphone. The storage area also has fold-in cupholder arms, so the area does double duty. “It’s a personal space,” said Halsey. Passengers will also appreciate the new Sovereign’s additional pre-cooler, which helps cool the cabin better. This improvement was based on the Sovereign technical committee’s input. Clarity will eventually be on all new production Citations, and passengers can control the system using the touchpads at each seat or by using their mobile devices. Clarity not only offers entertainment choices such as movies, music and moving maps but also can control lights, heating/cooling, window shades and communications with the outside world using the installed Aircell air-to-ground or satcom equipment. Passengers can even text each other or a pilot by tapping a seat icon on the graphical user interface (GUI). Peterson is right: the Sovereign is heavy on the controls, but when trimmed correctly it flies solidly and responds to every command without delay. We used about 3,000 feet of runway to take off at our weight of about 25,000 pounds with flaps set to 15 degrees (7 degrees is available for certain second-segment climb requirements, but requires more runway) then climbed to 43,000 feet in 18 minutes. At maximum weight, climbing to 45,000 feet takes 31 minutes. During takeoff the Garmin autothrottles automatically set takeoff power then bring the power back to maximum-continuous thrust after 10 minutes. The pilot can manually set speed limits on the automatic flight control system (AFCS) mode controller, or the autothrottles will follow programmed speeds in the G5000 FMS. It’s easy to tell whether speed is manually set or referencing the FMS; the manual speed shows up as a cyan speed bug on the airspeed indicator, while in FMS mode the speed bug is a magenta triangle. We climbed at 250 knots to 10,000 feet, then 270 knots/Mach 0.7 to FL430. Even when off, the autothrottles provide protection, both at high and low speeds. The low limit is 0.6 angle-of-attack, in which case the autothrottles will add power, and the high limit is the 305-knot Mmo, where the power is reduced to prevent overspeed. Peterson flight plans 2,200 pounds per hour of fuel for the first hour then 1,600 for the second and 1,500 for the third and subsequent hours. The more powerful engines use about the same amount of fuel as the earlier versions, she said. I hand-flew the Sovereign to FL430, where we leveled off and spent some time testing out features of the G5000 system, such as setting up holding patterns and inputting a crossing restriction. Instead of having to input a location and bearing and distance from that location, the G5000 needs only the distance before or after a waypoint and the altitude restriction. We didn’t encounter any turbulence, but Peterson said the latest version of the autothrottle software helps smooth out bumps with subtle throttle movements. On descent, we bumped up against the Mmo limit, but the autothrottles kept us from going too fast. And as we descended through 10,000 feet, the system automatically slowed the Sovereign to 250 knots. I hand-flew the ILS to 7,300-foot long Runway 19L. Vref was about 100 knots, although we had dialed in a slightly higher airspeed manually; the software at that point didn’t automatically look up the performance data in the G5000. At low speeds, the Sovereign is a little lighter on the controls and not quite so trucklike, and we slid down the ILS easily, with my control inputs guided by not only the G5000’s smooth flight director but also by the flight path marker, which I just needed to point at the touchdown point to ensure a proper landing. In retrospect, I would have dialed in a lower speed as I felt we came in a little hot, but I didn’t want to pull the throttles back because I wanted to experience the autothrottles automatically retarding to idle, which they did once we descended below 50 feet. After touchdown, the nose dropped smoothly and I stepped on the powerful anti-skid carbon brakes and engaged the thrust reversers but just at idle power. We still had plenty of runway remaining by the time we stopped. There is a lot more to the new Sovereign than meets the eye, but it won’t take pilots and passengers long to appreciate all the changes. The Garmin G5000 flight deck, the Clarity cabin management system, the new winglets, more powerful engines and the integrated interior design all combine to elevate the Sovereign into a new class of high-performance, comfortable and capable midsize jets.